Joey was born on January 1987. He was named after his Father and Grandfather. Joey was a fun loving and happy boy who always brought a smile to everyone’s face. He loved to play with hot wheels, and tonka trucks in the dirt. As he grew he started playing baseball, skateboarding and got interested in BMX bikes which he rode with his cousin Matty throughout his childhood. When Joey became a teenager his interests changed to snowboarding, dirt bikes, cars, trucks, hunting guns and spending time with his buddies playing video games and poker, and of course baseball which he continued to play his whole life. He loved his small town of Escalon, and was proud to say that was his home. He was a good ol’ country boy who loved country music and loved to dance. Everyone loved to watch him get down on the dance floor. 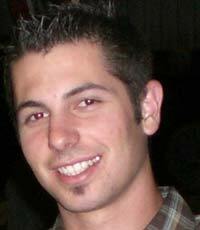 Joey went to Escalon High School where he made many great friends. He was part of the PIT class which made a positive impact on his life, that is when he became best friends with Blake. During high school, he snowboarded every weekend at Dodge Ridge with his friends in the winter and loved going to Santa Cruz in the summer. After graduation in June 2005 he went to Hawaii on his senior trip, his first taste of freedom. Needless to say, he had an awesome time. Then he decided he wanted to join the Local 669- Road Sprinkler family business Pinasco Plumbing aka Pinasco Mechanical Contractors. He was so proud to follow in his fathers footsteps and wear those Pinasco shirts with his name on them. The Most important thing to Joey was his family and friends. He was an old-fashion Italian Mama’s boy who did anything she asked, even when he didn’t want to. That was Joey, He always did the right thing. He was extremely protective of his three sisters Adriana, Virginia, and Michelle. No one messed with “Joey P’s sisters”. Joey had more friends than you could count and he would do anything for his friends and family. He will be remembered for his outgoing, loyal, easygoing, fun loving attitude. He often said: ” You only live once.” He really lived his life to the fullest. As Joey always said: “I’m Joey P, everybody loves me” and everyone did!